This book was a rare experience for me for two reasons. One: it is a young adult novel, which is not a genre I tend to read. Two: I loved it so much that I read it in less than twenty-four hours. 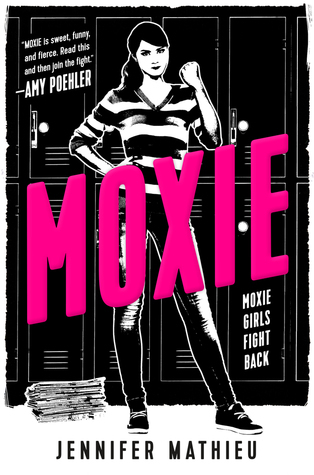 Vivian, a sixteen year old high school student from a small town in Texas, decides to start a Riot Grrrl-inspired zine called Moxie to vent about the sexism and harassment which is commonplace in her school. Vivian’s small act of defiance quickly grows into a movement, empowering young women (and men) across the school to challenge the behaviours and indeed the wider school environment which are both so patently unacceptable. I am loathe to use the term ‘girl power’ but effectively, that is what this story is all about. The homage to the Riot Grrrl movement of the early 1990s is heart-warming and (for those of us of a certain age) a little nostalgic. Mathieu does a really good job of crafting an engaging, entertaining plot filled with interesting, complex characters. The protagonist, Vivian, is drawn very realistically; a typical sixteen year old girl who just wants to get on with her studies and keep herself out of trouble. However, she also cannot help but see the unfairness and discrimination going on all around her and ultimately rebels, and rightly so! She is joined by her friends and classmates, an interesting supporting cast who are all different but ultimately come together in mutual support and recognition that they are more powerful together than apart. In short, this was a highly entertaining, relevant and powerful read. Five stars.